A laser level is an essential tool for home DIYers and contractors alike. Our team conducted extensive research on these devices and found the best laser levels across the major categories best laser level for outdoor use and best professional-grade laser level. For all of our selections, we include detailed information about the key benefits, such as durability, laser visibility and battery life. Read more about our methodology. The DeWALT DW089K delivers great performance at a reasonable price. It stands out as our top pick overall because of its precision accuracy and durability. With its three-beam laser, this single tool can easily do the work of two levels. 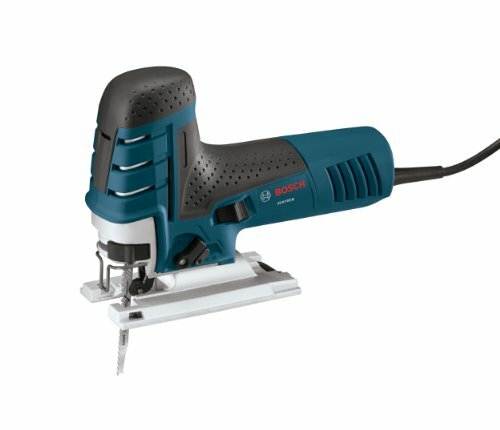 We Recommend the Bosch GTL3 for floor and wall tiling projects. It creates 90-degree lines, which are perfect for squaring and necessary when you’re laying down tiles. The level is made from water- and dust-resistant components. 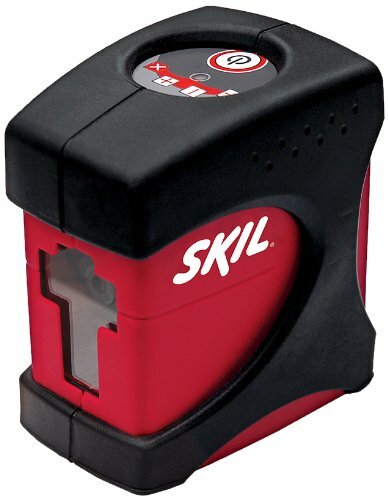 The Skil MT 8201 is a highly functional laser level at a great value. With features such as the multiple modes and automatic level sensing, it’s a top-notch and afordable tool for home projects. Hammerhead 24” digital laser level is great for measuring long distance angles for your indoor home projects. 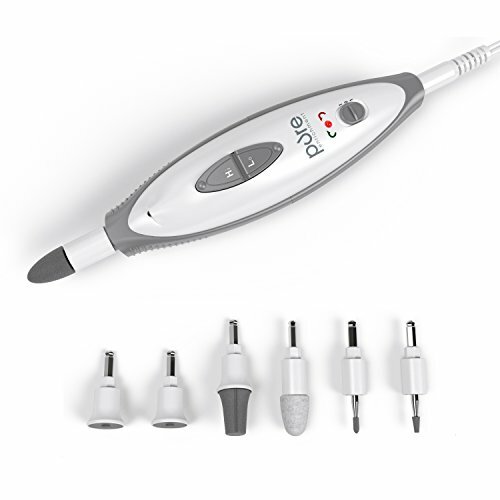 It offers a high degree of versatility by combining digital and laser levels in one unit. The Bosch GCL25 offers a level of function and versatility that both professional contractors and home improvement DIYers will appreciate. With five available laser lines, this level is perfect for every job. The DeWALT DW088LG 12V features a unique green laser beam can be seen even in bright sunlight. Add that to a long range of visibility and a durable outer molding, and this tool stands out as the top pick for outdoor laser levels. Depending on your project, you’ll need to consider how bright the laser beam is. If you’re working indoors in a small space, you don’t necessarily need the brightest beam on the market. However, if you plan on working outside or need to use the laser levels at a distance, you’ll need a beam bright enough for these conditions. The battery life and power sources vary from product to product. Some laser levels run on rechargeable lithium batteries, while others operate with two to four AA batteries. The battery life ranges anywhere from five hours to 30 hours depending on the laser level. When selecting a laser level, consider how often and at what durations you will be using it. Tools with extended battery life are great for contractors that need their laser level running on a job site all day. Consider how you’re going to mount your laser level and if you want to have different options. Some lasers come with a built in mount for a wall or ceiling, while others have a magnet so they can attach to metal structures. Other laser levels have brackets that attach to tripods, while others feature multiple mounting options. Whether you’re working on an indoor or outdoor project, the durability of a laser level is paramount. Look for tools that are dust proof and water resistant, as chances are high that at some point your laser level will get exposed to these elements. Some laser levels even have a roll cage to protect in the event of a fall. Others have been tested to survive drops from certain heights. You can also find laser levels that come with carrying cases so they won’t get damaged during transport. For about $90 you can find a self-leveling laser level. These have different mode settings based on your project. For a more basic model for indoor use, you can find a laser level with a digital LCD screen for around $60. If you’re planning to use your laser level for tiling floors or walls, you can plan to spend around $145 for a professional tile laser. Other professional-grade products for contractors to consider will cost between $260 and $300. 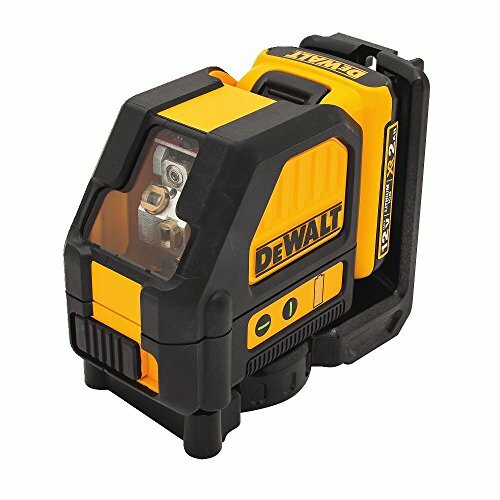 For most contractors, the DeWALT DW089K eliminates the need for carrying two laser levels for layout applications. The three-beam laser lines create 90-degree layouts with the bright red lasers. It’s one of the brightest laser levels on the market, so you can use it for outdoor projects and distance measurements. 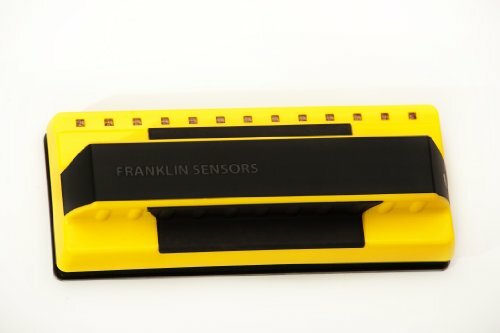 With up to 30 hours of usage, it has one of the longest lasting battery lives that you’ll find for a laser level. Eliminates the need for a second laser. The three beams on the DeWALT DW089K can help assist with 90-degree layouts. There is a second plumb line that intersects between the floor and ceiling. Contractors can use this feature for a layout application without using a second laser level. Extended battery life. 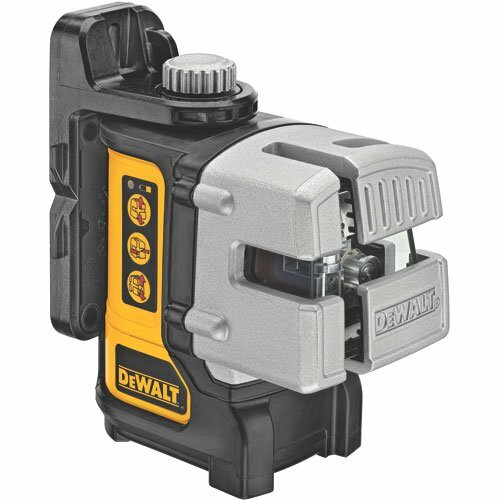 The DeWALT DW089K operates on four AA batteries. This laser level is rated to run for up to 30 hours before you need to replace the batteries, and users confirm that the battery life is exponentially longer than that of other models. Precise and accurate. It has a micro adjustable knob that lets you gradually adjust the layout lines in slight increments. The DeWALT DW089K is also one of the most accurate laser levels available on the market. It’s accurate within 1/8 inch at a distance of 30 feet. Bright laser beam. This tool has one of the brightest lasers that you can find. 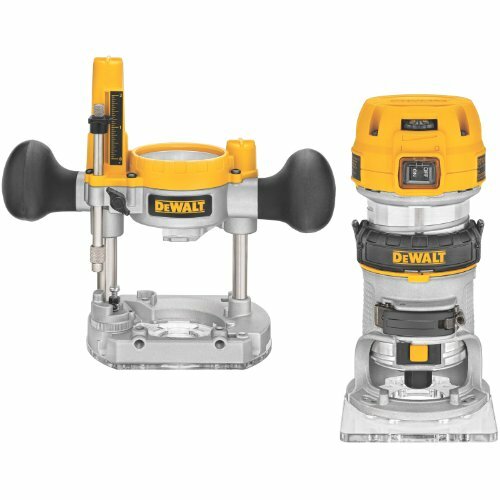 It’s advertised as being twice as bright as DeWALT’s other models, and multiple reviewers agree that it is. Extra accessories come standard. You can use the universal wall mount for any of your indoor projects. The mount also works on ceilings as well. Use the pivot bracket to attach the laser level to a tripod. A roll cage also protects the tool, in case it falls or gets hit while you’re working. Magnets lack power. The magnets on the base don’t hold as tightly as other laser levels on the market. At times, the magnets can cause the level to slide. Bosch GTL3 has a unique design that creates perfect 90-degree lines for squaring tiles. The magnetic base is strong to keep the laser level straight and secure whether it’s on the floor or the wall for different tiling projects. It has bright red laser lines so you can count on precision accuracy. The components are waterproof and dust proof, so the elements of your job site won’t impact or damage the laser level. 90-degree lines are perfect for squaring. Squaring is the most important laser level function when you’re working on a tiling project. This tool is great for both homeowners and contractors that are laying down tiles inside a house. Strong magnet base. 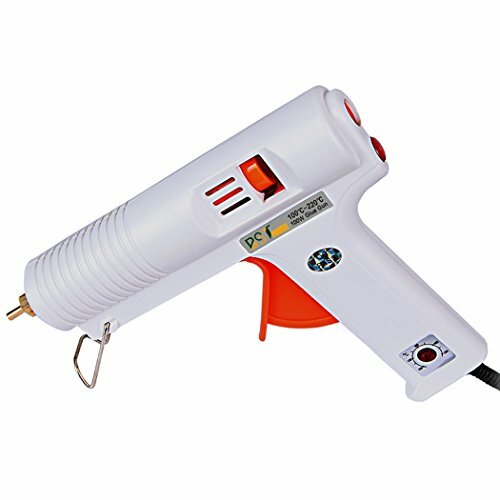 The magnet delivers a secure attachment so the laser stays in a fixed position while you’re working. It’s a strong enough magnet to keep the tool from falling if you position it on a wall while putting a tile backsplash in your kitchen or bathroom. Waterproof and dustproof. When you’re working on tiles, it’s inevitable that there will be dust and debris around your laser level. Neither of these substances will impact the functionality nor damage your tool. If you’re working in a kitchen or bathroom, you don’t have to worry about water breaking your Bosch GTL3. Bright laser lines. The red laser lines are highly visible so you can accurately tile floors and walls. Users also say the laser lines are crisp and sharp. You can position the lasers between 0 and 90 degrees and take advantage of the switchable 45-degree line, which verifies the position of square tiles. Not suitable for all projects. The Bosch GTL3 is almost exclusive to floor and tile projects. If you’re working on another home improvement job or outdoors project, you’ll want to consider another laser level. The lightweight, compact and portable design of the Skil MT 8201 laser level makes it a great addition to your tool kit. Its different laser modes can accommodate whatever project you have in mind, whether it’s large or small. The automatic level sensing feature ensures accuracy and precision with your work. Multiple laser modes for different projects. The Skil MT 8201 has the ability to project vertical, horizontal and cross lines. 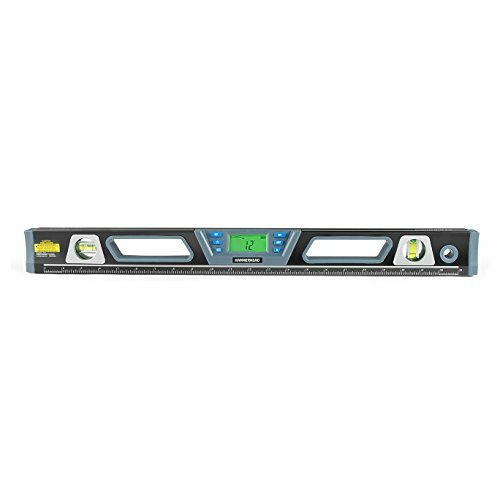 It also has a manual mode for precise level, alignment and plumb, so it can accommodate a wide range of projects. Automatic level sensing. If for some reason the level gets touched or moved while you are working, the automatic sensing feature will let you know that it’s out of level. It’s a great feature to make sure all of your work is precise and accurate. Compact and portable. The Skil MT 8201 comes with a carrying case so it stays protected while transporting to and from a job site. 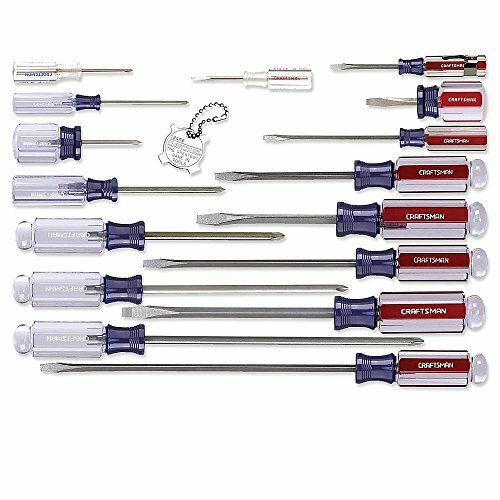 Weighing only three pounds, the lightweight design won’t be a weight burden to your tool kit. Laser beam not as bright as others. Compared to other lasers, this one is not that bright. It’s not the best option for outdoor projects or for measuring angles at long distances. With its LCD digital display that remembers your last nine measurements, the Hammerhead 24” Digital laser level is a great choice for saving you time and effort during indoor home projects. Its durable aluminum base attaches to magnetic surfaces as well as ¼ inch threaded tripod screws, which gives you options based on the project or your personal preference. The red laser is perfect for measuring long-distance angles indoors, since it’s visible for up to 100 feet. Durable aluminum base. The aluminum base has heavy-duty magnets that can firmly attach to flat surfaces. It also doubles as a ruler, since the base has inch and centimeter measurements along the sides. Compatible with tripods. If you prefer using the laser level on a tripod instead of a flat magnetic surface, it’s compatible with any threaded ¼ inch tripod. It fastens tightly to the tripod so you won’t have to worry about it falling. Long-distance laser. The red beam laser on the Hammerhead 24” Digital is visible up to 100 feet, which is perfect for measuring angles at long distances. Convenient digital display. The backlit LCD digital display area is simple and easy to read. It allows you to select your units in degrees, inches, and feet. The Hammerhead 24” Digital automatically inverts the display so it always reads right side up, regardless of the position. Integrated memory system. The Hammerhead 24” memory system recalls your last nine measurements, which saves you time while moving and setting up the level. It also has an audible indication feature to identify 0-, 45- and 90-degree angles. Not ideal for bright outdoor conditions. It’s hard to see the laser if you use it outside in direct daylight. The Hammerhead 24” Digital is more suitable for indoor use. The best professional-grade laser levels are versatile, so one tool can tackle many tasks. Many incorporate a squaring function that is good for tile jobs. Other common functions include horizontal leveling, vertical leveling, plumb transfers and layouts. Professional-grade laser levels are durable and can withstand being dropped or bumped around. The Bosch GCL25 has five different laser lines, which makes it one of the most versatile laser levels on the market. With a keyboard operation system, you can easily switch between vertical leveling, horizontal leveling and all of the other available modes depending on your project. Five different laser lines. 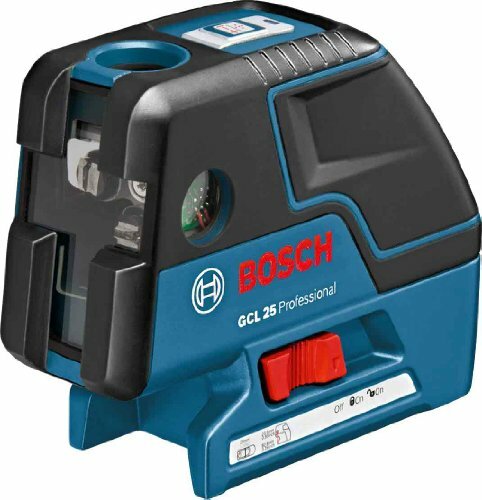 The Bosch GCL25 has laser lines for horizontal leveling, vertical leveling, plumb transfer, layout, and squaring. 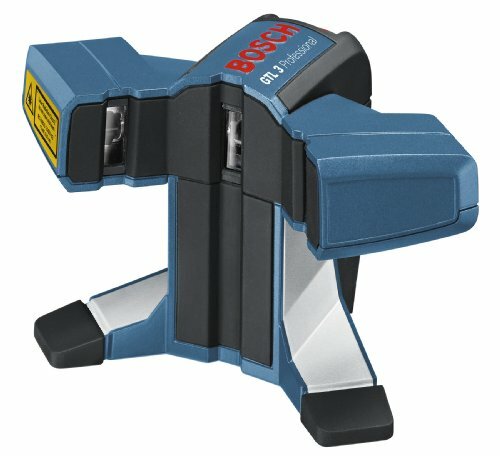 This Bosch model can accommodate different jobs, so you won’t have to carry multiple laser levels to a work site. Easy to use keyboard operation system. Users report that all of the functions are easily controlled by a simple keyboard interface. From here you can switch between all of the modes and determine which of the five lasers you want to have on. Self-leveling pendulum. The smart pendulum system lets you know if your laser is not level. Also, it can adjust itself to keep your laser line in a level position. Users report that the self-leveling functionality is a convenient time saver, especially for big projects like cabinet installs You can lock the pendulum when it’s not in use so it won’t get damaged during transportation. Extended manufacturer warranty. This laser level comes with a two-year warranty when registered within eight months of purchase. Short battery life. It runs on four AA batteries and the average battery life is five hours, which is fine for small jobs. If you are planning to use it all day on a job site, make sure you have extra batteries with you. Outdoor laser levels are useful to DIYers and professional contractors alike. They feature bright laser beams that can be seen in sunny areas and often can measure angles at long distances. 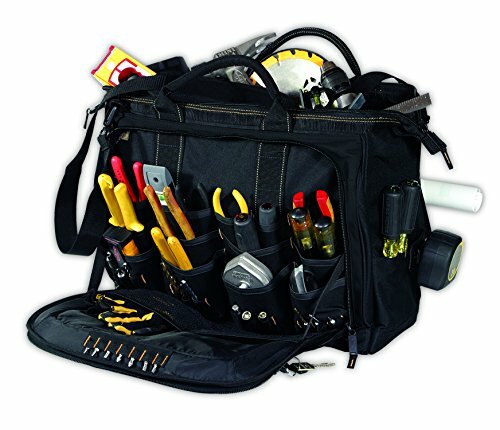 These tools are also made to withstand outdoor elements, such as dust, debris and water. The DeWALT DW088LG 12V has a green laser beam that’s four times brighter than red lasers. It’s resistant to water and debris, plus it can survive a small drop on the ground. All of these features make it a top choice for outdoor use. The rechargeable lithium battery and magnet bracket are additional bonuses features for an outdoor laser level. Visible in bright sunlight. DeWALT uses a green laser beam for the DW088LG 12V because it’s four times brighter than standard red lasers. Many users report that the green laser beam is easy to see even in bright conditions that would wash out the red beams produced by other models. Protected by durable molded housing. This level features a protective covering that makes it resistant to damage from water and debris. Users report that the level remained unscathed even after being dropped several feet. Rechargeable lithium battery. 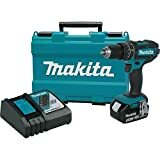 A 12V lithium-ion battery and charging kit are both included with your purchase. You don’t need to worry about carrying around extra batteries with you to the job site because this one is rechargeable. Built-in magnetic bracket. It has a rear mounted magnet bracket that attaches flush to steel and metal track. You don’t need a separate stand or mount to use this tool. Simply find a metal surface at the job site. Heavier than most. Weighing nearly nine pounds, this DeWALT model is one of the heaviest laser levels that you’ll see on the market.